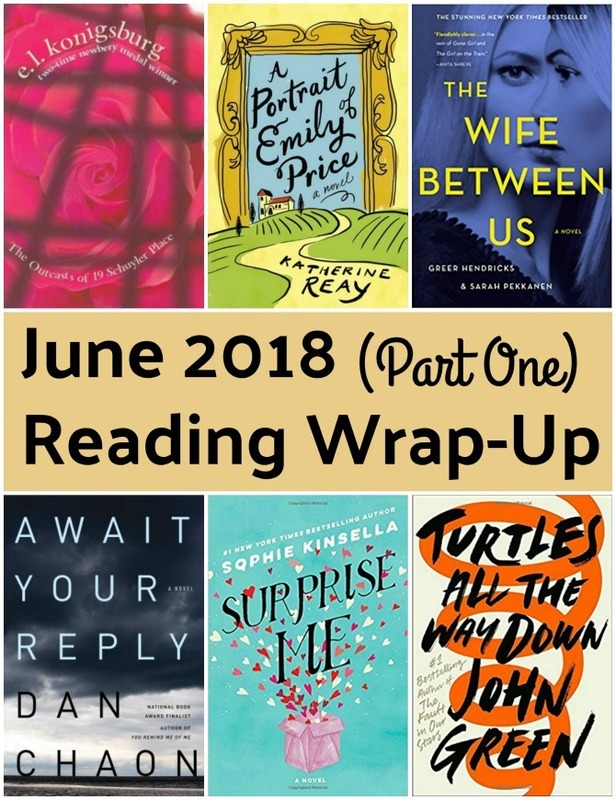 Welcome to Quick Lit, my monthly wrap-up of quick (and sometimes not-so-quick) book reviews. I’m trying something a little different with this series this month: instead of sharing Parts One, Two, and Three in back-to-back posts as I usually do, I’ll be spreading them out across the next couple of Mondays. Eighteen books seemed like a lot for a single week, so I figured spacing out the reviews might be a good alternative. Let me know what you think of this new format! 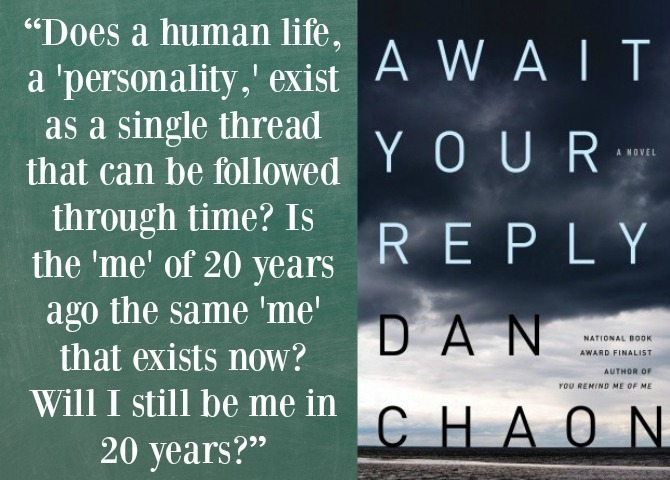 Await Your Reply, by Don Chaon: Await Your Reply is three stories in one. Miles is a middle-aged loner who has spent most of his adult life searching for his wayward twin, who went missing after a childhood of madness and unpredictability. Lucy is a recent high school graduate who is escaping her oppressive hometown the only way she can—with her charismatic history teacher, who promises her a future of wealth and ease. Ryan has recently connected with his estranged father; now his adoptive parents believe he’s dead, and he’s used his “death” as an excuse to embark on a life of crime. This book explores the nature of identity. Who are we, really? Does our identity lie in our names? Our pasts? Is it possible to rewrite our own stories, to become an entirely new person? How much of life is fabricated from unreliable memories; is any of it real? Does it even matter? Each character in this novel is forced to ask these questions, and their answers are not always clear. I spent most of this novel in a state of confusion. I had no idea where the various plot threads were headed; I assumed the three storylines were connected in some way, but had no idea how. The stories do eventually converge within the book’s final pages, and in a way, their unification felt like an afterthought. This frustrated me until I read the author interview at the back of the book. Apparently these three characters came to the author separately, and it was only after writing a majority of the novel (over several years) that he realized how their three stories were one. This backstory gave me an appreciation for the novel’s artistic merit and transformed my opinion of the book. If you enjoy plot-driven novels with clearly defined story arcs and tidy endings, you might want to skip this one. However, if you appreciate enigmatic characters and enjoy liberal doses of philosophy in your thrillers, you will love this book. As I read, I was fascinated by the way Chaon’s mind must work in order to compose such a novel; these feelings were solidified after reading the author interview, and I would love to read more from him. 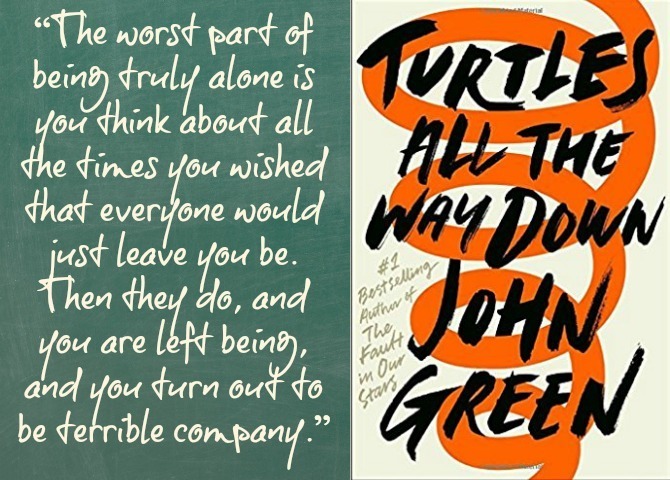 Turtles All the Way Down, by John Green: Sixteen-year-old Aza hasn’t had it easy. She lost her dad at a young age, and her relationship with her mom is strained. But her biggest struggle is with herself, and the mind that seems determined to defeat her with its inescapable thought spirals and untamable “invasives.” Aza is doing all she can to keep her disordered brain a secret, even from her best friend Daisy, with whom she is pursuing the mystery of a fugitive billionaire. The investigation leads Aza into a relationship with the billionaire’s son, Davis, who becomes yet another loved one with whom Aza must attempt to keep her secrets. Turtles All The Way Down offers the most compelling portrait of OCD that I have ever encountered in fiction. (Green himself suffers with OCD, which explains his ability to capture the disease so intimately.) Something I haven’t discussed much here on the blog is that I personally suffer from Obsessive Compulsive Disorder, and while my obsessions and compulsions differ from Aza’s, her experience with the disease bears an uncanny resemblance to my own. I related to Aza’s frustrated determination to gain control over her unruly thought patterns, as well as her fear that interventions were either unhelpful or even detrimental. Green’s descriptions of Aza’s fraught experience helped me understand my own inner demons, and I have no doubt that even readers without experience with OCD will learn a lot from Aza. Personally, it was helpful to see how Aza’s disorder affected those around her, and how they handled the relationship challenges presented by her disease. Aza is certainly the high point of this novel. I also enjoyed the witty dialogue, quirky side characters, and periodic philosophizing, all trademarks of Green’s writing that I love and that continue to surprise me with each of his books. I appreciate the intelligence of his writings, rather atypical for YA. Unfortunately, these elements were not quite enough to fully redeem the book for me. The plot itself is weak, nearly nonexistent, absorbed by Aza’s faulty brain; the effect is to highlight OCD’s dominance over one’s life, and while it makes a powerful point, it does not make for particularly absorbing reading. 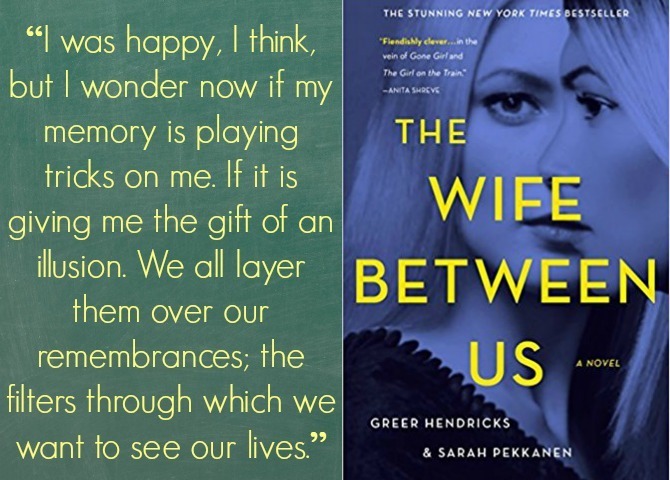 The Wife Between Us, by Greer Hendricks and Sarah Pekkanen: The Wife Between Us is the story of a man, his jealous ex-wife, and the fiancé whom his ex is desperate to prevent from becoming his next wife. The premise seems straightforward, but we quickly learn that none of these players is as they seem. The novel is told from the perspectives of Vanessa and Nellie, two seemingly dissimilar women who have loved the same man. Nellie is young, innocent, and falling hard for the smooth-talking Richard who almost seems to good to be true. Vanessa is older, hardened, and set against seeing Richard remarry. Their stories overlap and eventually merge in some mind-blowing ways, leaving the reader scrambling to find out whose story is the truth. The unreliable narrator is a popular trope these days, and I am fully on board. I LOVE a good twist, and this one completely caught me off guard. Unfortunately the twist takes place fairly early on, and the second half of the book wasn’t quite able to maintain the same breathless pace. Still, a great and incredibly creepy read with fascinating characters, oodles of suspense, and some very intriguing storytelling. 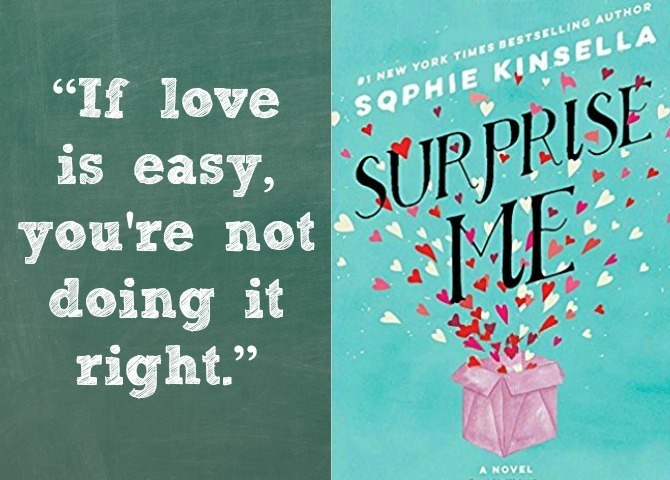 Surprise Me, by Sophie Kinsella: Sylvie and Dan have been together for ten years. Their marriage is a comfortable one, predictable but stable. They are “that couple,” the ones who finish each other’s sentences and appear to know all there is to know about one another. Then a doctor makes an offhanded remark about their good health and predicts they have a good sixty-eight years of marriage ahead of them. That number frightens Sylvie and Dan out of their comfort zone. How can they continue to happily coexist for that much longer? To shake things up, the couple decides to start surprising each other. It begins with small gestures, but the surprises take a dark turn as they uncover secrets from their past—secrets that have the potential to ruin their sixty-eight year forecast. This book surprised me, in a good way! I haven’t read much from Sophie Kinsella, but based on her reputation for fluffy chick-lit, I didn’t have high expectations. But the writing is smart and funny, and I truly enjoyed the characters. The premise is an intriguing one that left me wondering how well I know my own husband, and whether or not there are some things that are better kept a secret. I especially enjoyed the exploration of extended family dynamics and how those play into a marriage. I won’t give away the ending, but I didn’t see it coming—another (happy) surprise. 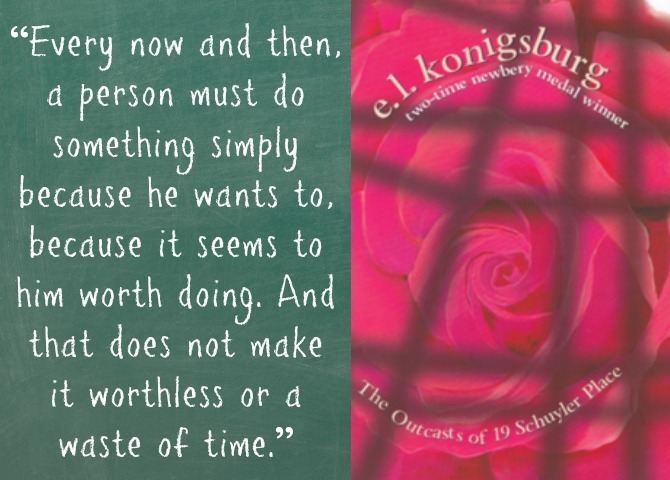 The Outcasts of 19 Schuyler Place, by E. L. Konigsburg: From the Mixed-Up Files of Mrs. Basil E. Frankweiler was a childhood favorite, and I enjoyed The View From Sunday when I read it a couple of years ago, so when I came across this more recent novel from E. L. Konigsburg while perusing the OverDrive options, it was an easy “yes.” Molly Ringwold’s narration was an added bonus. The book tells the story of 12-year-old Margaret Rose Kane who is sent to summer camp while her parents are in Peru. The camp experience proves to be a disaster, but Margaret is rescued by her eccentric uncles who take her home to their magnificent home at 19 Schuyler Place. During her stay, Margaret discovers that the neighborhood is plotting to destroy the house’s magnificent towers that her uncles have spent decades designing and constructing from various odds and ends. Margaret is determined to rescue the towers and gathers an eclectic team of allies to help her in her mission. This is a fun little story with quirky characters, plenty of heart, and hilarious tongue-in-cheek narration. The story felt a little too straightforward to me, though; despite many wonderful elements, the book as a whole was lacking that special something that I was hoping for from a Konigsburg novel. 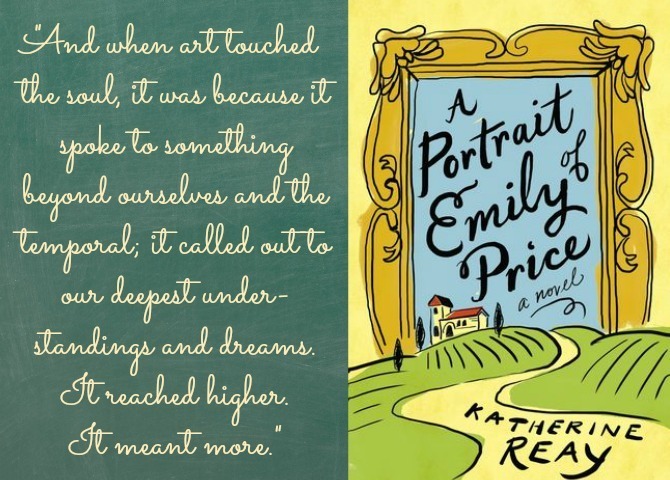 A Portrait of Emily Price, by Katherine Reay: Emily Price is an amateur artist and all-around-fix-it-girl. As the responsible oldest daughter of a broken family, Emily prides herself on being able to fix anything she lays hands on, whether that’s antique pieces of art or her sister’s floundering career. While traveling in Atlanta helping to restore a home destroyed in a fire, Emily meets Ben, a dashing Italian who is in the United States to perfect his family’s pizza recipe and assist his aunt and uncle in bringing life back to their family restaurant. Emily and Ben quickly fall for each other, and Emily suddenly finds herself married and on a plane to Italy to live with Ben’s deeply traditional family—some of whom welcome her with open arms, and others who do not. This novel has a lot going on. As with Reay’s other novels (this is the third I’ve read this year) we are quickly dropped into the story, making for a rather jarring first few chapters. Once I’d settled in with the charming characters, I warmed to the story, only to be taken for a new adventure in the novel’s second half. I liked both parts of the book, but the pacing felt a bit off. I also struggled to get onboard with the whirlwind romance, which wasn’t very believable to me (though it did make for good reading). While I loved the characters and the magnifico Italian setting (I have a huge soft spot for all things Italian; I dream of one day living in Tuscany), it was the insightful dialogue and keen life perceptions that stood out to me in this book. For me, the sign of a good novel is one that is heavily highlighted, and by the time I finished Emily Price, my copy was arrayed in color. Don’t get me wrong, I always enjoy a fun novel, but I love them so much more when they make me think, and once again Reay managed to prompt some great introspection. Have you read any of these books? I’d love to know what you thought!